Following are links to pages — and videos — summarizing my two-plus hours teaching “WordPress 101” at the 2016 Fayetteville WordCamp, July 22-24. The session — an introductory beginners class — covers the basics of using WordPress to create — for free — both blogs and conventional websites for personal and business projects. WordPress.com is emphasized in demonstrations to create a site then its pages and posts. WordPress.org details are integrated into the presentation. Slide Set I — introduction including a quick history of open source principles and WordPress. It is posted to SlideShare.net. Slide Set II — Mostly how-tos on creating and editing the home page, posts and pages and uploading images. For the convenience of all it too is posted to SlideShare.net. The example website, Croquet Fan’s Croquet Club, while online is not real, just for use in the live demos. 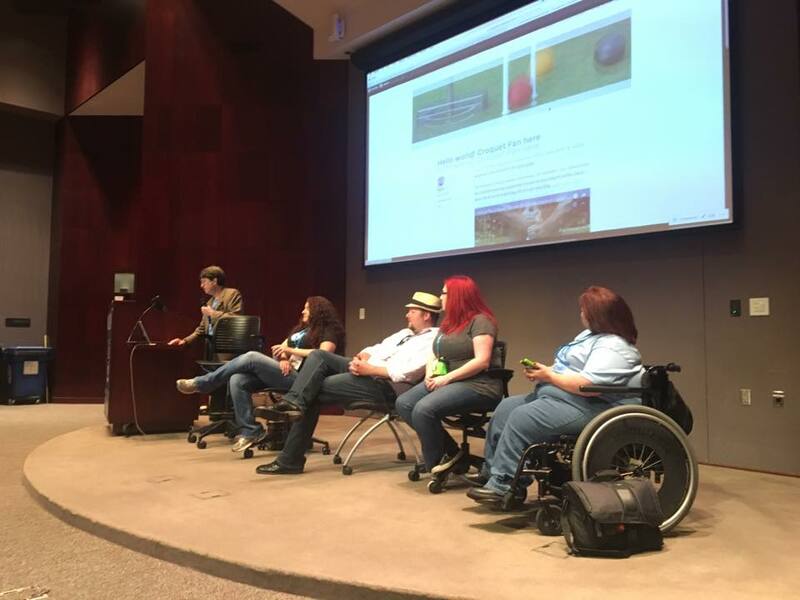 Ben Pollock at lectern moderates on July 23, 2016, a panel, “WordPress 101 Wrap-Up,” including Brandee Spears Segraves (from left), Michael McCranie, Monica Fields Foster and Jamie Smith. New this year were guest speakers who discussed specific components. Rebecca Haden explained analytics, focusing on reports calculated by the JetPack Stats plug-in. Here is the SlideShare link to Rebecca’s slides. She is the founder and creative director of Haden Interactive, where WordPress websites are built, optimized, and maintained with blogging, analytics, social media, and content marketing. Jason “Sky” Shabatura discussed in words not slides how to organize a website, especially its home page, to engage the type of viewers the website owner wants. Sky is a web developer based in Northwest Arkansas, passionate about WordPress, with experience in many aspects of design, development, maintenance, support and training. Jamie Smith gave particulars on how to use a website set in WordPress.org to best advantage. Here is a the SlideShare link to Jamie’s slides. She operates Jamie’s Notebook, a professional writing services company. Her background is in journalism and she uses those skills for a wide variety or client projects including blogs and websites. The press release for #wcfay 2016 gives details of the overall weekend, held at the Donald W. Reynolds Center for Enterprise Development at the University of Arkansas. The above was conducted 9-9:50 a.m. and 1-1:50 p.m. Saturday, July 23. A panel discussion 3-3:50 p.m., “WordPress 101 Wrap-Up,” moderated by me, gave participants a wide range of local experts to answer any website question: Brandee Spears Segraves, Michael McCranie, Monica Fields Foster and Jamie Smith.